University of Alabama at Birmingham biomedical engineers report a significant advance in efforts to repair a damaged heart after a heart attack, using grafted heart-muscle cells to create a repair patch. The key was overexpressing a gene that activates the cell-cycle of the grafted muscle cells, so they grow and divide more than control grafted cells. This UAB study, published online in Circulation Research, is led by Jianyi "Jay" Zhang, M.D., Ph.D., chair and professor of the UAB Department of Biomedical Engineering and holder of the T. Michael and Gillian Goodrich Endowed Chair of Engineering Leadership. Researchers first showed that overexpression of CCND2 in the human induced pluripotent stem cells-derived cardiomyocytes, or hiPSC-CMs, increased the proportion of cells that exhibited markers for the S and M phases of the cell-cycle, and for cytokinesis, as measured in cell culture. When they injected overexpressing hiPSC-CMs into the infarct region and the border of the infarct in the mouse model, the left ventricle ejection fraction was significantly greater at week four and the infarct size was significantly smaller, as compared with mice receiving normal hiPSC-CMs that did not overexpress CCND2. Both treatments were improvements as compared with untreated mice. Overexpression also led to an increased number of engrafted hiPSC-CMs, as measured by bioluminescence and human cell markers. This appeared to be due to proliferation of the cells because both the number and proportion of overexpressing hiPSC-CMs increased from week one to week four, and the human cells engrafted in the heart tissue expressed markers for the S and M phases of the cell-cycle, and for cytokinesis. Why a heart attack? Arteries clog-up.mainly from high BP.smoking, lack of exercise, fatty diet, and genetics says Am. Heart Assn. AHA is fully funded by Big Med & B. Farma, by 1M$ for every low sat-fat product with a AHA 'Heart Healthy' Label.. the truth ain't here! 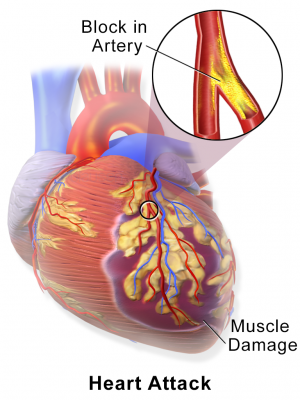 3 Main causes of arteries calcifying are..
1. High blood homocysteine..needs vitamins B12, B6 & folates to lower. Butter and cream synthesize these in the gut with 'friendly bacteria'. A long term, large scale study.. two groups geographically separated by their work. They were same: genetic origin, age group & activity level. The North workers t ended cooked only with butter, ate fatty meat; smoked more than the South ones had a pure vegetarian diet. The Southerners had 15X (fifteen times) the heart disease incidence of the Northerners. Butter also has Vit K2 that sends calcium to bones, away from arteries. Malhotra S L Dr. (The Lancet UK Med J published 11X), Idiotic advice.. skip the butter and cream.. cont. 2. Artery inflammation is caused by insufficient anti-oxidants in the diet. Inflammation is shown by high LDL 'marker' reading. This leads to calcification,. 2 egg yolks daily have enough anti-oxidants, selenium, l-cysteine, other amino acids and vitamins to stop inflammation. Eggs are high in vitamin K2. Raw yolks better, wash shells well, cook whites. I eat up 3 raw,10+ total/D. Idiotic advice is for 2 yolks a week. 3 High triglycerides are blood fats elevated by too many carbs, especially sugar and.. alcohol. Idiotic advice is 'stuff yourself with carbs all day, ie grains 11X/D unlimited fruit, 6 t/s of sugar'! Left it late? Explore EDTA.. cleans out 30Kms of arteries.. with 19 other good side effects Oral is cheap,takes 6Months. IV is pricey and quicker. My arteries at 79 are CLEAN as shown with a high speed camera during a heart scan.